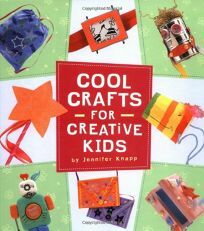 Kids can make ""Hollywood Handbags,"" folksy robots out of tin cans, ""funny putty"" and ""silly slime"" with Cool Crafts for Creative Kids by Jennifer Knapp. Most elements are already in the kitchen cabinet. Bright photographs of finished crafts, funky illustrations and easy-to-follow instructions add to the appeal. (Sept.).